We know it's not a bird—but this spine-tingling image of a stalking Leopard by guide Joe Grosel on our recent Namibia & Botswana trip really caught our eye to kick off the gallery. 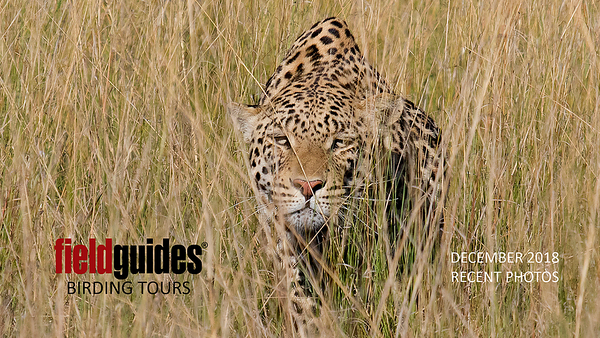 The following images will also include these recent Field Guides tours: Madagascar, Vietnam, New Guinea & Australia, Colombia: Cali Escape, a private Ecuador: Rainforest & Andes, Southeast Brazil, Serra dos Tucanos (Brazil), New Zealand, Colombia: Llanos & More, Chile, Slice of California, Jamaica, plus a revisit to Northwestern Argentina. Lots to see! Double vision?... 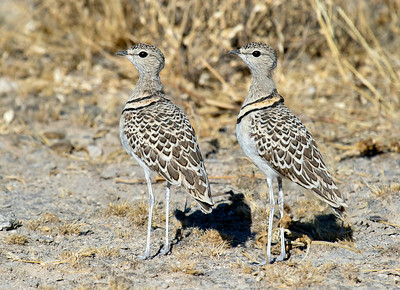 No, just two Double-banded Coursers synchronized in every way. Photo by guide Joe Grosel. 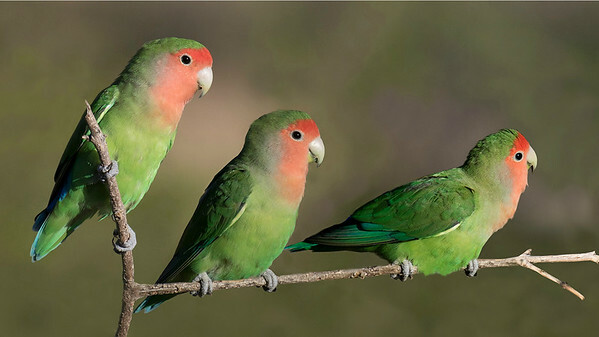 Feral populations of Rose-faced Lovebirds have established themselves in the United States, but seeing these lovely parrots in their native habitat at Erongo was exciting. Photo by guide Joe Grosel. 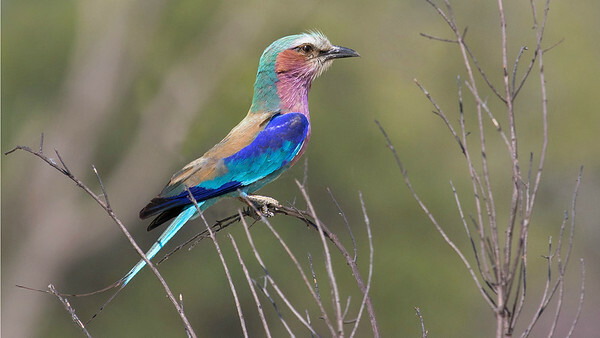 A myriad of pastels come to life on a Lilac-breasted Roller. Photo by guide Joe Grosel. 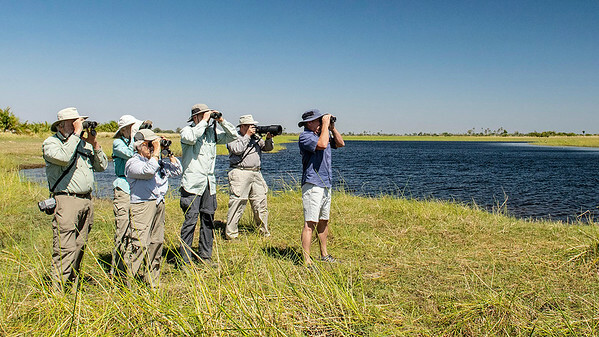 Guide Joe Grosel (r.) leads the group in a scan of wetlands at Macatoo. Photo by participant Don Taves. 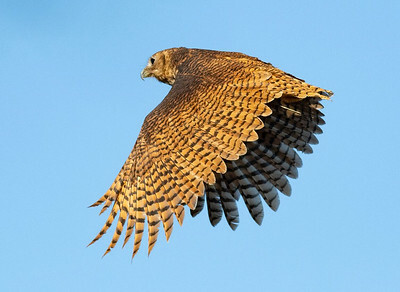 The nocturnal-feeding Pel's Fishing-Owl occupies a similar niche to Osprey but with a more varied diet. Photo by participant Don Taves. Evolution is amazing. 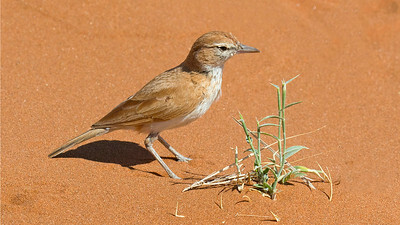 The dorsal plumage of this Dune Lark really helps it blend into the substrate, reducing its detection by potential predators. Photo by guide Joe Grosel. The King of Beasts. Photo by guide Joe Grosel. Let's head due east and off the continent for images from Madagascar. 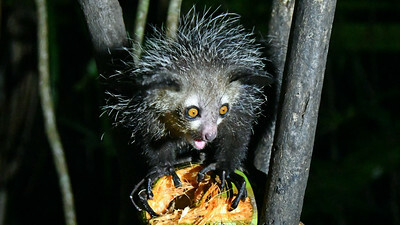 The Aye-aye, a lemur, might be the most bizarre among Madagascar's many unusual creatures. Photo by participant Linda Nuttall. 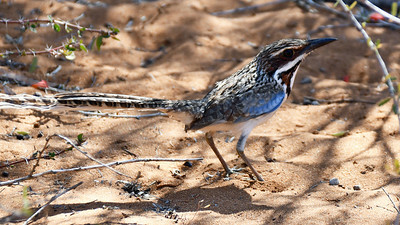 The stunning Long-tailed Ground-Roller can only be found in southwestern Madagascar. Photo by participant Linda Nuttall. 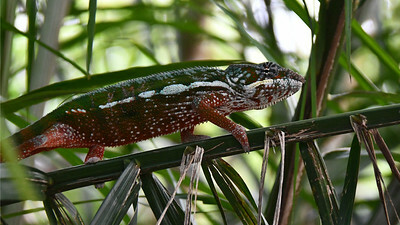 Madagascar is rich with interesting reptiles like this polychromatic Panther Chameleon. Photo by participant Linda Nuttall. 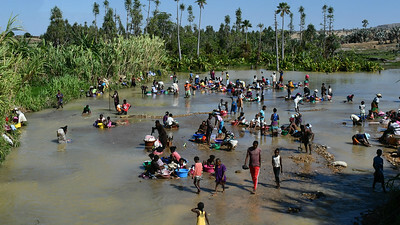 Laundry day in Madagascar takes on a very different look than in the United States. Photo by participant Linda Nuttall. 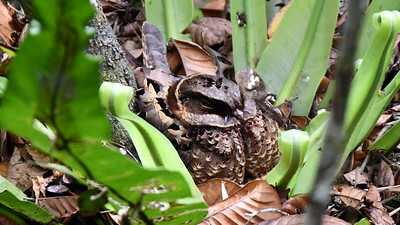 This incubating Collared Nightjar simply melded into the forest floor. Photo by participant Linda Nuttall. 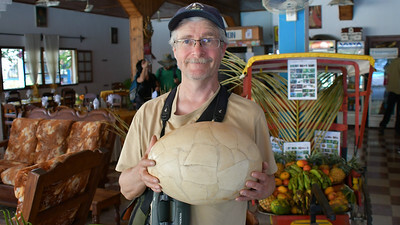 Participant Mark Chojnacki provides some perspective on how incredibly massive an Elephant Bird egg was. Photo by participant Linda Nuttall. 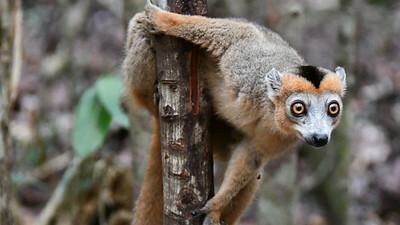 An inquisitive Crowned Lemur seemed as captivated with us as we were with it. Photo by participant Linda Nuttall. 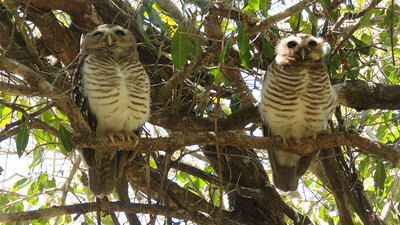 White-browed Owl is one of many endemic species on Madagascar. 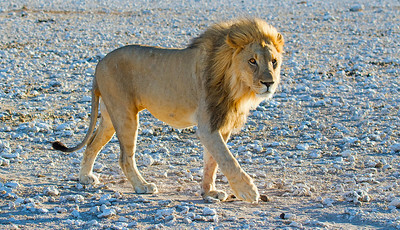 Photo by guide Phil Gregory. 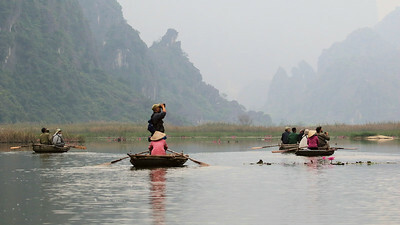 Next up are images from our Vietnam tour. 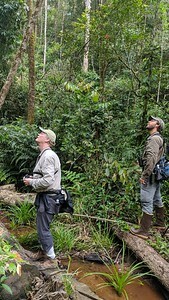 In this image from participant Robert Pacheco, guides Dave Stejskal (l.) and Doug Gochfeld are busy scanning the canopy. 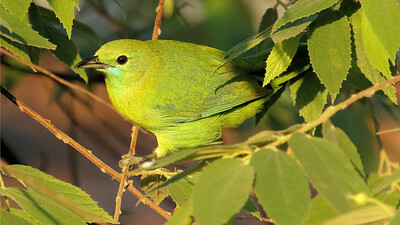 Few species are as evolved to blend into foliage as a Blue-winged Leafbird. Photo by participant Stan Lilley. 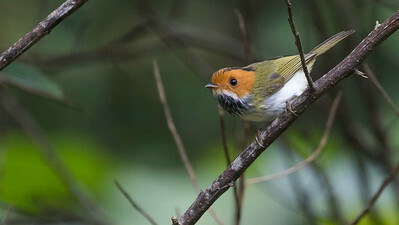 Guide Doug Gochfeld did a marvelous job of capturing this Rufous-faced Warbler. Photo by guide Doug Gochfeld. 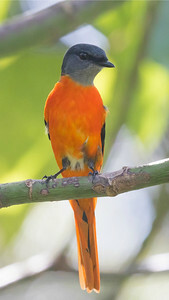 The officially recognized name of this species is Gray-chinned Minivet, but it appears "carrot" should be incorporated somehow. Photo by guide Doug Gochfeld. 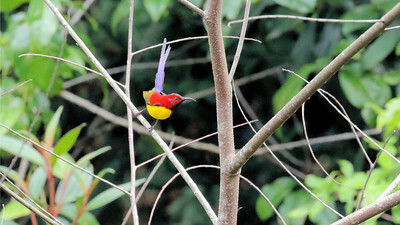 A burst of color reveals a Gould's Sunbird of the "Purple-rumped" subspecies. Photo by participant Stan Lilley. 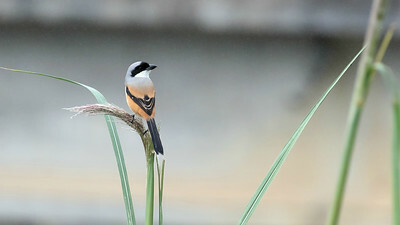 This handsome little hunter is a Long-tailed Shrike. Photo by participant Stan Lilley. We had the distinct pleasure of exploring Van Long Preserve by boat. Photo by participant Stan Lilley. 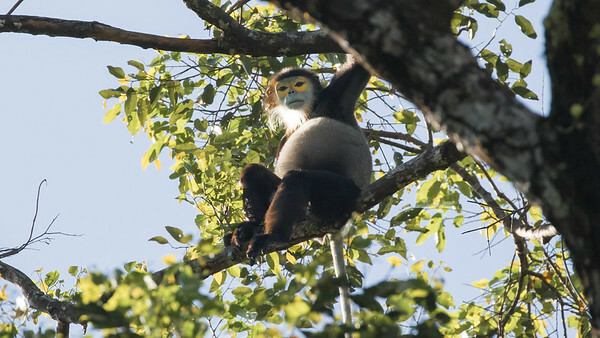 Seeing the "painted face" of an endangered Black-shanked Douc was one of many indelible moments during our tour of Vietnam. Photo by guide Doug Gochfeld. Let's move on to our New Guinea & Australia tour. 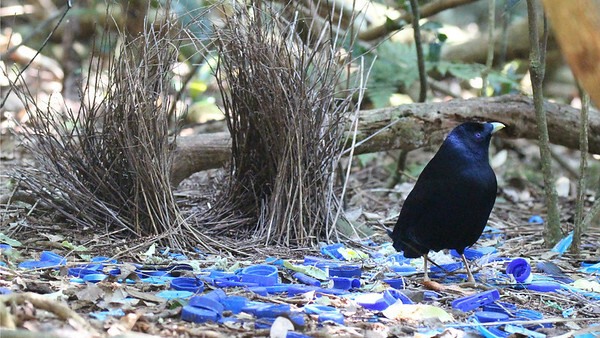 Kicking off this set is a male Satin Bowerbird attending his bower. He seems to think the proliferation of blue plastic waste could work in his favor. Photo by participant Matthias von den Steinen. 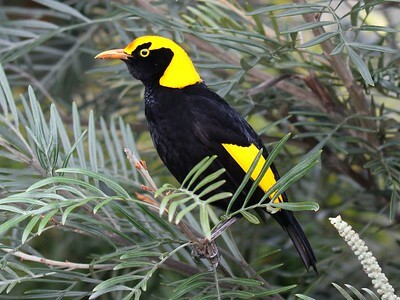 The eye-popping plumage of a Regent Bowerbird reliably ends up inspiring many "oohs" and "aahs." Photo by participant Matthias von den Steinen. 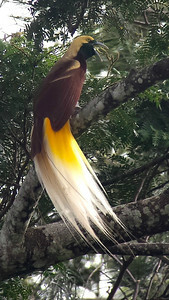 This astonishing Lesser Bird-of-Paradise was unforgettable. Photo by guide Jay VanderGaast. 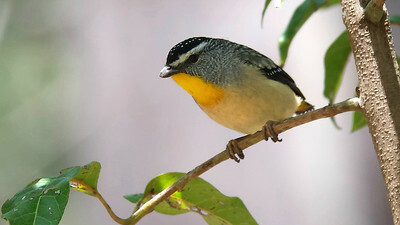 Female Spotted Pardalotes lack the brilliant golden throat that this male sports so well. Photo by guide Jay VanderGaast. 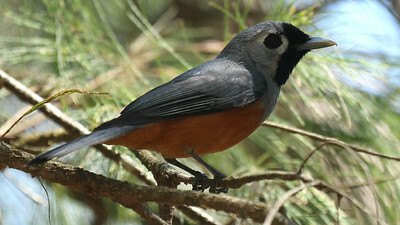 We couldn't have asked for a better look at Black-faced Monarch. Photo by participant Matthias von den Steinen. 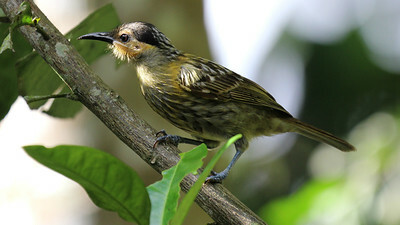 There are nearly 200 species in the honeyeater family, and about half of them occur in Australia. This one happens to be a Macleay's Honeyeater. Photo by participant Matthias von den Steinen.